1. Use the Spiralizer to cut the zucchini into noodles (peeling the zucchini is optional). 2. In a large pan, heat the olive oil on medium heat, and lightly sauce the carrots and onions until translucent. 3. Add the zucchini noodles and cook for 3 minutes. 4. Add the chicken, sauce and spinach and cook until the chicken is warm and the spinach is wilted. 5. 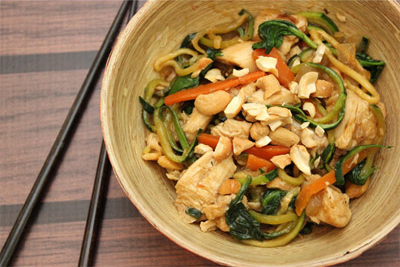 Serve warm and top with chopped cashews.